Open-field test provides a unique opportunity to systematicaly assess novel environment exploration, general locomotor activity, and provide an initial screen for anxiety-related behavior in mice. Wild-type mice will typically spend more time exploring the periphery of the arena than the unprotected center area. Animals that spend significantly more time exploring the unprotected center area demonstrate anxiolytic-like behavior. Mice are allowed to freely explore the arena. Distance, activity, time spent in the center vs edge are measured using video-tracking system. A 10-min test length is commonly proposed for assessing novel environment exploration, but longer tests can be performed. Rearing behavior and grooming activity can also be scored manually. 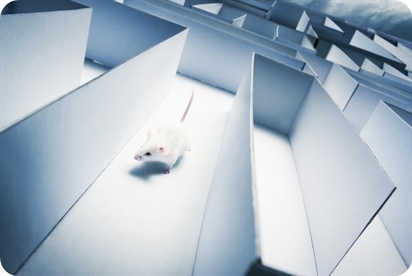 This test takes advantage of the natural tendency of mice to explore novel environments. Animals have the choice between open/unprotected maze arms and enclosed/protected maze arms, elevated at 1 m from the floor. Mice tend to avoid the open areas, favoring darker and more enclosed spaces. This appoach-avoidance conflict results in behaviors that have been correlated with increases in physiological indicators. Anxiolytic treatments results in increased exploration of the open arms, without affecting general motivation or locomotion.